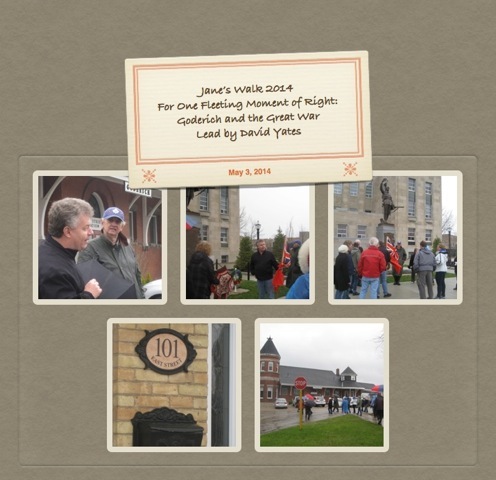 Jane’s Walks 2014 in Goderich. In honour of Jane Jacobs, a community organizer, activist and author, Goderich, along with 100 other towns and cities world wide, hosted Jane’s Walks this past weekend. Jane Jacob died in 2006 at the age of 89, and the walks are held to celebrate her life, her vision and influence and her birthday; May 4th. Jacobs believed in walkable neighbourhoods and that towns and cities work best when planned by and for the people who live in them. Thus the goal of the walk is to have people explore their communities and connect with the people who live in them. Goderich hosted it’s first Jane’s Walk event in 2013, a single walk touching upon many topics. Building upon that success, this year 7 walks were hosted over 3 days, (Friday May 2nd to Sunday May 4th), on a variety of themes: architecture, photography, history, nature and beach ecology. Jane’s Walks are another example of Goderich being on the cutting edge–we did our first walk last year; Vienna just joined this year! On Saturday, David Yates, a well researched history teacher, columnist and excellent presenter, lead a walk entitled: “For One Fleeting Moment of Right: Goderich and the Great War”. Beginning at the cenotaph on The Square, and walking down East Street to the old CNR train station, David took us along the street and back in time. He captured a proud, important and yet poignantly sad day in Goderich’s history, and spun his story so well that I will now “see” East Street with it’s current view, and as it was on an October day in 1916. World War I was into its second year in 1916, and the hope that it would be a ‘quick war’ had vanished. The Battle of Somme was being fought and more troops were needed. On October 4th 1916 in Goderich, over 600 young men, some returning to the war after a brief furlough home, and some heading off to war for the first time, gathered on The Square where the cenotaph now stands. Remember that in 1916, the cenotaph did not exist, the courthouse was the original Victorian style building with its main entrance facing east, and people travelled by foot or horse and buggy. The day had been declared a “holiday” by the mayor; business and schools were closed and over 3,000 people massed around the square and lined the route down East Street to the train station. A brief ceremony took place and then the soldiers proudly, and no doubt with trepidation, walked past their families, friends and neighbours to the awaiting train, and to their destinies. It is estimated that approximately 1/3 of those soldiers did not make it back to be embraced and thanked by their neighbours, friends and families. David Yates had so many interesting stories about the buildings and homes along East Street and the people living in them at the time. Even though the rain began at the exact moment that the walk started, the walk passed too quickly. Hopefully David will lead a repeat performance for next year’s Jane’s Walk or other walks about our local history. Jane’s Walk is an annual event, be sure to mark your calanders for 2015; you won’t want to miss it. The Maitland Trail Association hosts a variety of fun and informative hikes year round, so participate in some of those as you wait for Jane’s Walks 2015.